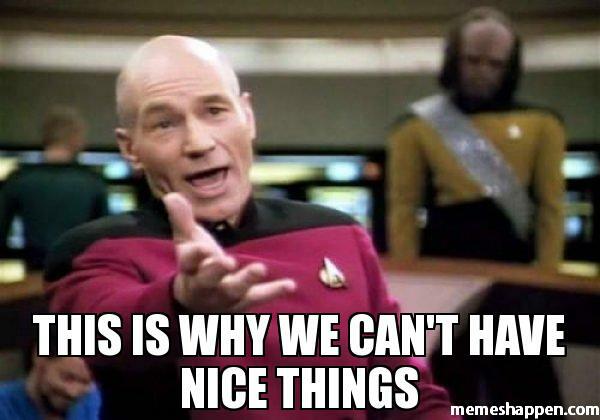 Editor's Note: This post was originally published on April 21, 2017. Housecall continues to share this piece due to ongoing requests and reader interest. Home burglary generally has a pattern; criminals are looking for an easy target they can rob fast. Learn from the pros. Here are six tips from career burglars you can use to defend your home and prevent break-ins. Burglars like to break in to homes during daytime hours—the last thing criminals want is to encounter someone at home. Weekdays are ideal for thieves, since weekend schedules are too unpredictable. Between 12:30 p.m. and 2:30 p.m. are the most popular times because there’s a high chance people will be away at work or school. While it’s tempting to post about your vacation to your social media feed, wait to share those trip photos and exotic location check-ins until you’re back home. Criminals scout public social media accounts like Twitter, Instagram, Facebook, and Foursquare to find victims. Locating someone’s home address using basic information from their social media profile is surprisingly easy. In one survey of convicted burglars, more than 10 percent say they used social media to determine who was out of town. The same survey found one burglar stole over $250,000 in electronics and jewelry from 33 women he saw in public—he used GPS data embedded in photos they posted online to find their homes. Also, tricks that make it look like you’re home really work, professional burglars reveal. Burglars run from properties that look like people are inside. Motion sensor lights, bright flood lights, and timed lights are inexpensive security features for a home’s exterior that scare criminals away. TVs or radios left on, as well as cars parked in the driveway, make burglars nervous that someone is home. If you’re a proud gun owner, that won’t scare away burglars—it entices them. A gun is stolen roughly every two minutes in the U.S., so homeowners should be sure to always lock up their guns. NRA bumper stickers on a car or Smith & Wesson signs on a house advertises that there are lots of guns to steal. Keep your expensive items out of sight. 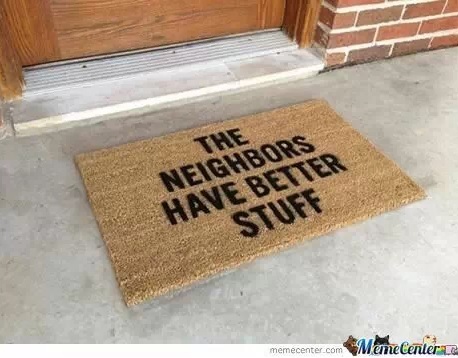 You’re making it too easy for a burglar by advertising the type of valuables they can steal. Don’t leave a new MacBook in front of your first-floor kitchen window, iPads on your living room ottoman, or even a nice car in a garage window with a clear sight line to the street. Key hooks—especially with labels for each key—need to be concealed out of view from windows, too. “A burglar appreciates such kindness, but you will find it expensive when you have to replace all the locks after a break-in,” says Mike Fraser, former professional burglar and host of the BBC show Beat the Burglar. Fraser also advises to leave large family calendars out of view. You’re inviting a break-in by detailing when you’ll be away, Fraser says. This advice goes for any ID documents, too. Mail or other personal information left in plain view is a gold mine for a criminal looking to easily steal your details for identity theft. Using these tips can help you protect your home from break-ins. Also, be sure to research crime rates and trends in your neighborhood and state. Just like some houses are safer than others, some states are safer than others. Where does your state rank? 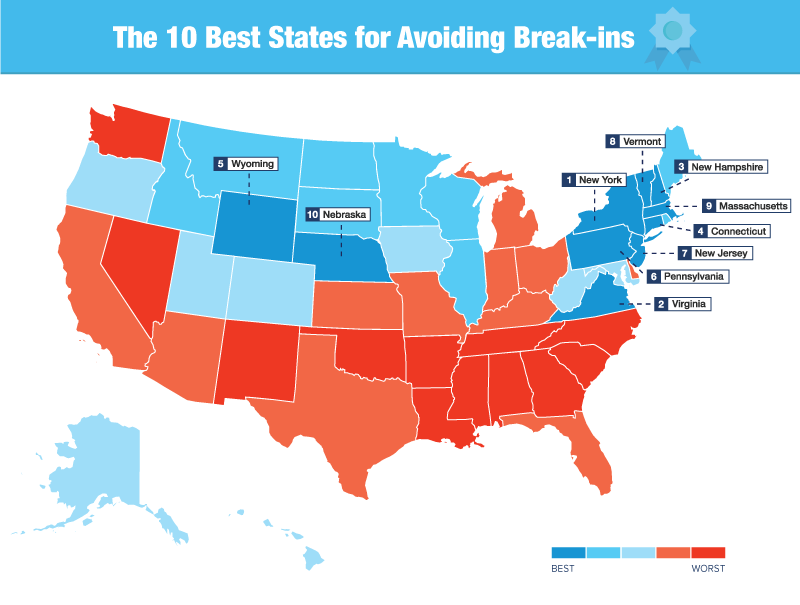 Using data collected by the FBI, ASecureLife compiled a list of the 10 states with the lowest numbers of recorded break-ins per 100,000 inhabitants in 2015. Krystal Rogers-Nelson is a Safety & Security Expert for ASecureLife. As a homeowner and mother of a rambunctious toddler, she specializes in topics ranging from home and financial security to parenting and child safety. When she’s not writing or researching, she enjoys making art, watching cheesy rom-coms, and spending time in nature. Great newsletter! Is it okay to share with others? I would like to use this article for our Civic League Newsletter. Timing of burglarly was a good insight. It makes sense too. Most people are away from the house during lunch or work hours. Not many home to question someone going in or out.